Nancy Grace Reacts to Casey Anthony Verdict – STUNNED! Love her or hate her, Nancy Grace, the always outspoken TV personality is always on the side of the people. When there is a big trial or murder mystery you can rely on Nancy Grace’s HLN tv show to cover it, and that is exactly what she has done for the past three years on the Caylee Anthony murder and subsequent Casey Anthony trial. She has been clear in her stance that she believes Casey Anthony murdered her daughter Caylee Anthony. Upon today’s not guilty verdict in the Anthony trial, Nancy Grace is MORE STUNNED by the outcome than when OJ Simpson was found not guilty. And frankly so am I. This is an OUTRAGE and true MISCARRIAGE of justice! Grace goes on to say that Anthony not only got away with murder but will most likely get a “big fat book deal” or “made for TV movie” and profit from this case. 11 Comments on Nancy Grace Reacts to Casey Anthony Verdict – STUNNED! 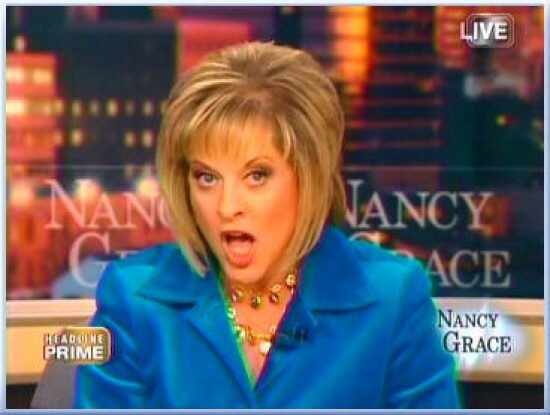 I <3 Nancy Grace! Am I the only one? I am heartsick…and frankly disgusted…I can see why those jurors don’t want to show their faces…The system doesn’t always work, but we have nothing better with which to replace it. The defense team partying is disgusting..tasteless. I found their remarks afterward, particularly Cheney Mason’s, arrogant and tiresome…blame the media….Thank God for the media…It sheds light on the dark places so that truth has a better chance of coming out…God Bless you for shining that light on this case and all the others. Victims need an advocate and you are a tireless one…John David and Lucy are going to be so proud of their mother as they grow older and see all the good you do. how can we not be shocked!! who else would of killed that innocent child? to think George,Cindy and Lee helped Casey get away with this murder disgusts me too! I am sickened by this. Is it time to revamp our country’s jury system? Are jurors given a definition of “reasonable” doubt? If so, please share it with me! You are all so sad and need to find something more productive to do with your time than consume the utter sensational bs that Nancy spews everyday. Name one piece of evidence that proves the child was even murdered. If you cannot prove that, then nothing else matters. this horrible mother guilty! There were plenty of eye openers to come out with a guilty verdictof some kind. I question their intelligence. I am outraged at the juridiction system. I hope that Caylee’s memories follow Casey every days of her life. She sacrified her daughter for a “Better Life.” I do pray that one way or the other justice will be done for this beautiful little girl. nancy grace on the ‘side of the people’? yeah with no brains but operating on full hysteria….she gets 1st place for perpetrating the image of ‘ugly american’….can’t stand the bee-utch….like watching a hissing, angry, howling cat. I couldn’t sleep last night because I’m haunted and disgusted that a jury of 12 let this killer off so easy!!! This case taught me two things, LIE and KEEP QUIET to get off!!!! I am so thankful for the media, who strives to keep us informed. Nancy is one of those rare individuals who is bold enough to step out and give her educated opinions on matters of the law- yes, she influences public opinion by using both her knowledge/brains mixed with jet desire for justice. She has heart!!! Those of us who give a damn about justice have heart. I live in Orlando, am highly educated, and am disgusted by this verdict. This was a clear misunderstanding of the definition of “resonable doubt”. The jurors were ignorant saying there was no proof – or motive – what trial were THEY watching? Prosecutors beware – you must truly DUMB down your points for ignorance. Disgusting that no one on the jury held out for their own personal truth. It will be interesting to see how their personal lives with their friends and loved ones are affected- this is a true American tragedy – and an example of why southerners have a rap for ignorance. A northern educated jury would have never ruled this way. So true about this case…the prosecution did a very sh**ty job this time, thumbs up for defense. I personally am sad about the verdict, the evidence seems concrete enough but as you can see, everyone can be swayed one way or another, even a jury of 12 people.